Interferry CEO Mike Corrigan reflects on the global trade association’s hectic year of involvement in three key areas of concern. 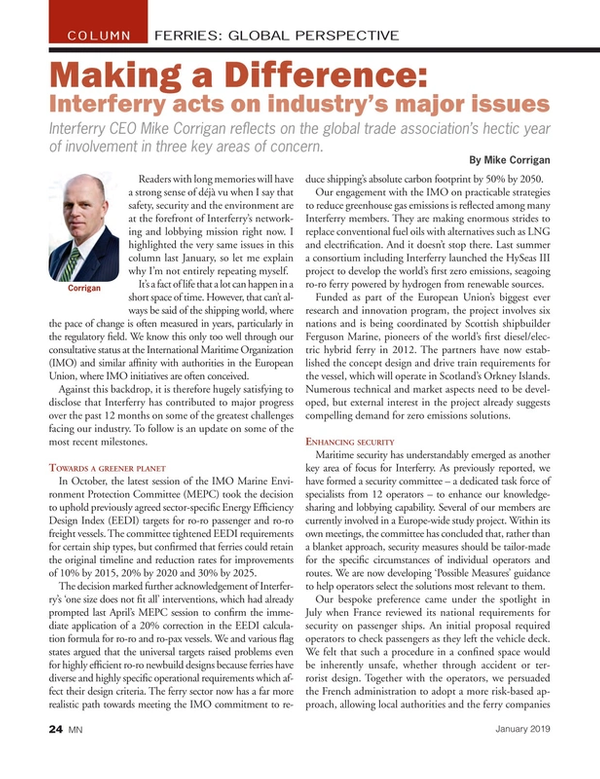 Readers with long memories will have a strong sense of déjà vu when I say that safety, security and the environment are at the forefront of Interferry’s networking and lobbying mission right now. I highlighted the very same issues in this column last January, so let me explain why I’m not entirely repeating myself. It’s a fact of life that a lot can happen in a short space of time. However, that can’t always be said of the shipping world, where the pace of change is often measured in years, particularly in the regulatory field. We know this only too well through our consultative status at the International Maritime Organization (IMO) and similar affinity with authorities in the European Union, where IMO initiatives are often conceived. Against this backdrop, it is therefore hugely satisfying to disclose that Interferry has contributed to major progress over the past 12 months on some of the greatest challenges facing our industry. To follow is an update on some of the most recent milestones. In October, the latest session of the IMO Marine Environment Protection Committee (MEPC) took the decision to uphold previously agreed sector-specific Energy Efficiency Design Index (EEDI) targets for ro-ro passenger and ro-ro freight vessels. The committee tightened EEDI requirements for certain ship types, but confirmed that ferries could retain the original timeline and reduction rates for improvements of 10% by 2015, 20% by 2020 and 30% by 2025. The decision marked further acknowledgement of Interferry’s ‘one size does not fit all’ interventions, which had already prompted last April’s MEPC session to confirm the immediate application of a 20% correction in the EEDI calculation formula for ro-ro and ro-pax vessels. We and various flag states argued that the universal targets raised problems even for highly efficient ro-ro newbuild designs because ferries have diverse and highly specific operational requirements which affect their design criteria. The ferry sector now has a far more realistic path towards meeting the IMO commitment to reduce shipping’s absolute carbon footprint by 50% by 2050. Our engagement with the IMO on practicable strategies to reduce greenhouse gas emissions is reflected among many Interferry members. They are making enormous strides to replace conventional fuel oils with alternatives such as LNG and electrification. And it doesn’t stop there. Last summer a consortium including Interferry launched the HySeas III project to develop the world’s first zero emissions, seagoing ro-ro ferry powered by hydrogen from renewable sources. Funded as part of the European Union’s biggest ever research and innovation program, the project involves six nations and is being coordinated by Scottish shipbuilder Ferguson Marine, pioneers of the world’s first diesel/electric hybrid ferry in 2012. The partners have now established the concept design and drive train requirements for the vessel, which will operate in Scotland’s Orkney Islands. Numerous technical and market aspects need to be developed, but external interest in the project already suggests compelling demand for zero emissions solutions. Maritime security has understandably emerged as another key area of focus for Interferry. As previously reported, we have formed a security committee – a dedicated task force of specialists from 12 operators – to enhance our knowledge-sharing and lobbying capability. Several of our members are currently involved in a Europe-wide study project. Within its own meetings, the committee has concluded that, rather than a blanket approach, security measures should be tailor-made for the specific circumstances of individual operators and routes. We are now developing ‘Possible Measures’ guidance to help operators select the solutions most relevant to them. Our bespoke preference came under the spotlight in July when France reviewed its national requirements for security on passenger ships. An initial proposal required operators to check passengers as they left the vehicle deck. We felt that such a procedure in a confined space would be inherently unsafe, whether through accident or terrorist design. Together with the operators, we persuaded the French administration to adopt a more risk-based approach, allowing local authorities and the ferry companies to agree solutions for specific ships and services. In recent months Interferry has also been involved in encouraging dialogue with the CSO Alliance of maritime company security officers, which has 700 members in more than 40 countries and runs a 24/7 support platform linked to all the key military and merchant marine reporting centers. A keynote presentation by the Alliance at our 43rd annual conference in October explained a new initiative to combat cyber attacks and also announced ongoing discussions to form a sector-specific security partnership between ferry ports and ferry operators. Interferry’s key role in wide-ranging safety initiatives is growing at ever-increasing pace. Last year I mentioned that we had set up a working group to join a European Maritime Safety Agency study on fire protection. The initial phase has focused on vehicle deck electrical connections and the effectiveness of traditional detection and extinguishing systems. In March we made a crucial intervention at the fifth annual session of the IMO’s Ship Systems and Equipment (SSE) sub-committee, arguing that some proposals – such as fitting earth fault breakers and the positioning of sprinklers - were practicable for newbuilds but needed to allow for adaptations to the current systems on existing ships. The second phase of the study is now under way, with findings due to be submitted at this year’s SSE6 session. I also reported last January that we had formed a Domestic Ferry Safety Committee to help forge world-class improvements in developing nations. Domestic routes account for 93% of known fatalities – almost certainly under-recorded at around 1,200 per year – and two-thirds of these occur in seven countries headed by the Philippines, Bangladesh and Indonesia. The committee was briefed to carry out a risk assessment, identify drivers for change and then approach potential collaborators and funding partners such as suppliers, classification societies and the IMO. Considerable headway has already been made, with participation in a series of safety summits in Asia including both sessions to date of the specially formed ASEAN Regional Forum (ARF) on ferry safety. The latest of these was in China in November and, like the inaugural workshop, offered invaluable insights on best practices. The event was co-hosted by the Philippines, where there has been a notable safety upsurge in recent years. We have now applied for financial support from a leading charitable foundation which, if successful, will enable us to carry out a ‘lessons learned’ project in the Philippines for the benefit of other developing nations. Meanwhile, Interferry’s long-standing engagement with the IMO on safety in these nations was acknowledged by China in December within their proposal to the 100th session of the IMO’s Maritime Safety Committee (MSC) for a comprehensive study on domestic passenger vessel safety. National sovereignty has always presented a procedural challenge for the IMO given that its remit is usually confined to international regulations. However, MSC noted strong support for the issue and invited China and others to submit more detailed proposals for future consideration. Summing up … it’s been an exceptionally busy year, but that is entirely in keeping with Interferry’s status as the ferry industry’s global voice. Safety, security and the environment are issues that our current 230 members in 37 countries regard as a journey, not a destination – and this combined strength will ensure that we continue to make a difference. Mike Corrigan is CEO of Interferry, the trade association that represents the worldwide ferry industry. Mike brings extensive executive experience in the ferry industry, most recently as the CEO of BC Ferries, one of the world’s largest ferry operators. During Mike’s tenure with BC Ferries, the company became recognized as a world leader in safety and operational excellence, set record earnings levels, invested $2 Billion in ships and terminals, and established itself as an employee-centric company earning top employer recognition.